S earch the phrase "vegan person" on Shutterstock, and it will return 486 pages of results that would insinuate all vegans live a life among lavish spreads of ripe fruits and crisp vegetables, eating bowls of perfectly dressed salad, and basking their lithe bodies under an abundance of sunlight while donning perfectly bleached smiles. 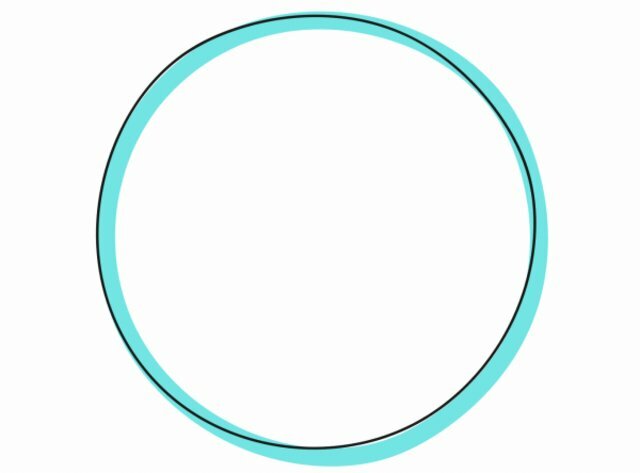 Spend a few more minutes scrolling and you realize something a little more questionable is afoot: It takes until the bottom of Page 3 until you see a single face of color in an image. Shutterstock, as a proprietor of easily digestible slices of curated reality, is a strange crystal ball that can reveal uncomfortable truths about mainstream narratives if you stop to think about it. There is a clear divide within the world of veganism that is, quite literally, black and white. Mainstream veganism, which advocacy sites like Vegan Voices of Color define as "white veganism," tends to overlook vegans of color by excluding them from the dominant discourse. The result is two very distinct and separate vegan cultures often at odds with each other. Veganism as most people think of it today didn’t emerge as a concept until 1944 when British woodworker Donald Watson coined the term to separate vegetarians who ate animal products from those who did not. Watson, lauded by many as the father of mainstream veganism, went on to found The Vegan Society, which helped solidify veganism's place as a lifestyle. But these ideologies and traditions had flourished in communities of color for centuries prior, if not longer. Eastern religions like Hinduism, Jainism, and Buddhism all advocate eschewing animals and animal products in some format because of the belief systems centered around nonviolence. Cruelty-free eating is also a strong thread in Rastafarianism, where followers, who reject unhealthy manners of living, engage in a way of eating know as Ital, stemming from the word "vital." The diet, encouraging plant-based unprocessed meals, was developed in the 1930s in Jamaica, and is believed to have evolved from Hindu traditions brought over with indentured Indian servants, according to the Miami New Times. The Black Hebrew Israelite community, which was established in the late 19th century, also adheres to a strict vegan diet, believing it to be the secret to eternal life. "My dad grew up in the Hebrew Israelite community, so I've always known a lot of black vegans," says Jenné Claiborne, a vegan food blogger and the author of the upcoming cookbook Sweet Potato Soul. "In Atlanta, where I was raised, there are a few black-owned vegan restaurants that have been around for decades. It’s nothing new." Zachary Toliver, a producer at PETA, seconds this. "Black vegans aren't a new thing," he says. "Vegan restaurants have been around for decades in black communities. There's a vegan Jamaican spot here in Tacoma, [Washington] that's been around as long as I've been alive. White vegans didn't invent cruelty-free living. It didn't start with them, and it won't end with them either." "White vegans didn't invent cruelty-free living." Do a quick Google search, and it’s easy to see why mainstream veganism is largely considered to be a white movement worldwide. Lists of "25 Vegan Celebrities" typically includes only a handful of black and brown faces amongst a glut of white entertainers. Each entry of The Independent’s "9 Best Vegan Cookbooks" is written by a white author and employs a strikingly similar minimalist aesthetic that would sell well to the Goop set of people who are slender, white, and wealthy enough to afford $30 plates of kelp noodle cacio e pepe to go with their $13 turmeric elixirs. Spoon University’s list of "10 Vegans to Follow on Instagram" compiles image after image of healthy bowls made by white vegans specifically to play well on Instagram. The majority of high-profile vegan restaurants -- ones that land in the pages of publications like Food & Wine and Bon Appétit -- are also run by white chefs. Due to this misrepresentation about the true scope of veganism, it’s not unusual for many vegans of color to think that they are alone. "I can't tell you how many people come up to me at events and tell me that it's so good to see someone who looks like me speaking," says Lauren Ornelas, the founder of the Food Empowerment Project, and a self-described "proud Mexican-American." Emiko Badillo, the founder of Portland’s first all-vegan grocery store, credits the same acute visibility problem to why she decided to start the Portland Vegans of Color group. "I started becoming disenfranchised with the vegan community in Portland when I realized how white-dominated veganism was," Badillo explains. "I put a call out to see who might be interested in forming a vegans of color group, and the responses showed me how much of a need there was for [one]." 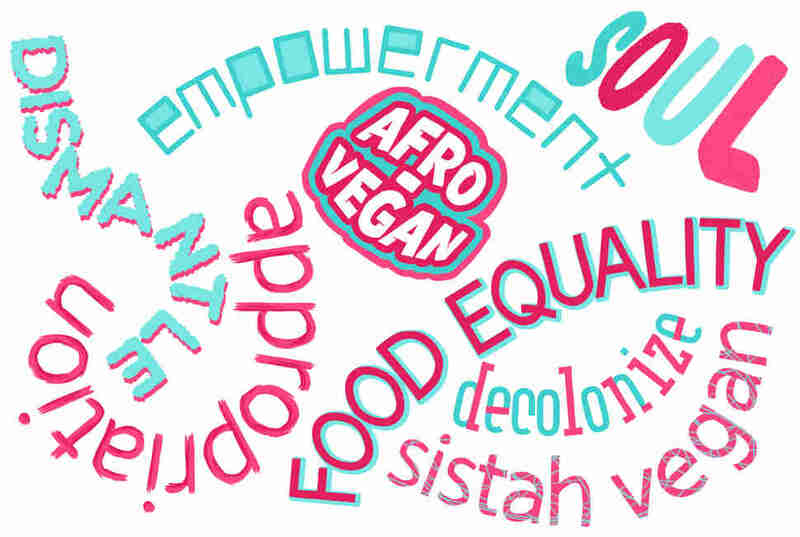 Vegans of color have inadvertently developed their own language that they use to talk about their veganism. "When you are a marginalized group within a marginalized group, it only makes sense for this to form," says Badillo. "It is a survival instinct." Books proudly display terms like "soul," "afro," "sistah," and many other phrases especially popular in the African-American vernacular. "It’s very important to have this language," adds Claiborne. "The words have different meanings to different groups of people. It’s almost like a code. It’s a signal that this book is for vegans of color." The community is vibrant, filled with large food festivals and support groups like Black Vegans Rock and Badillo's Portland Vegans of Color that aim to empower, educate, and celebrate the contributions of vegans of color. Activist Aph Ko was so fed up with the idea that "veganism is white" that in 2015, she decided to compile a list of prominent black vegans to show many people were out there. Her efforts resulted in a list of 100 people, ranging from the civil rights activist Coretta Scott King to cookbook authors like Afya Ibomu, that was widely circulated. It was the first time someone had compiled undeniable proof that veganism was thriving in communities of color. It was a turning point, says Claiborne: "I thought I lived in a bubble, that black vegans only existed in big cities, but then I realized that we are everywhere." In the handful of years since Ko's list, the community has continued to expand rapidly, with some members managing to break into the mainstream. 2017 saw the release of black vegan chef Bryant Terry’s popular cookbook Afro-Vegan, which saw an incredible amount of success, selling 50,000 copies since it was released. "We are happy with the sales of this book and it is doing very well in a crowded market. Ten Speed is also doing a second book with Bryant Terry that should publish next year," says Erin Welke, a senior publicist at the publishing house. 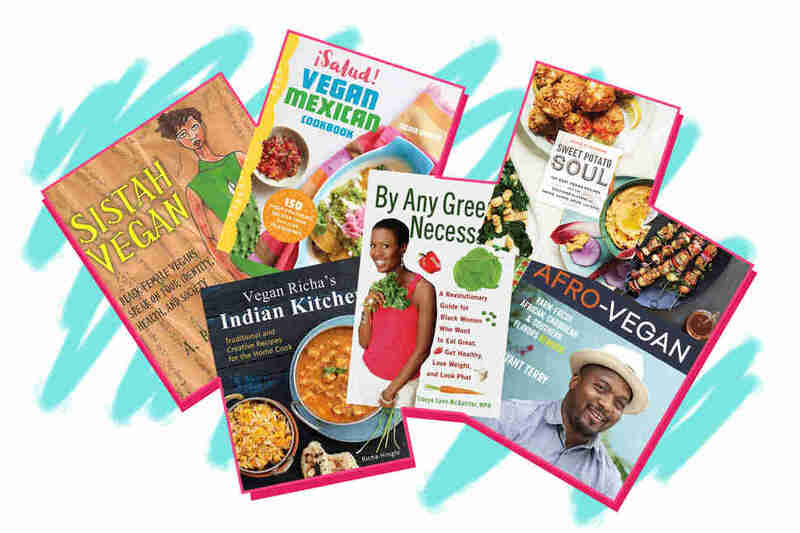 Alongside Terry, a handful of vegan cookbooks written by vegans of color (including Claiborne) will be released by big-name publishing houses like Random House this year, as well. POC-owned vegan restaurants are now more common than ever, and continue to open across the country. And more black celebrities are publicly jumping on the vegan train, including RZA, Venus Williams, and Beyoncé, with the launch of her 22-day vegan diet plan. Even with that much star power, mainstream veganism still manages to elbow out vegans of color as it's convenient. In the most striking example, foods most associated with vegan meals -- crumbly blocks of tofu, fluffy quinoa, pots of chia pudding, "wraps" made from collard greens instead of tortillas, pulled-pork sandwiches made from jackfruit -- originated in communities of color who have been eating these items for hundreds of years before they were plucked and reclothed as "superfoods" or clever meat alternatives, stripping of them of their identities. "They borrow from so many different cultures, for sure," says Claiborne with an exasperated laugh. When anything gets sucked up into the current of what’s trendy, the price goes up, making it harder for the communities that have long depended on these ingredients to afford them. "When a thin, white vegan lady says something is cool, tons of people listen," says Badillo. In addition to lifting ingredients from cultures of color and calling them their own, mainstream vegans are frequently "veganizing" cuisines that never needed it. "It’s as if they think that communities of color are unable to turn their own food into something that’s vegan," says Claiborne. It was something that she feared as she was writing her upcoming soul food cookbook -- one that is inspired by her grandmother’s cooking and her upbringing in the American South. "I was thinking to myself, ‘Please don’t let any white people come in and make a vegan soul food cookbook before I get around to it because that is just going to be crazy,’" Claiborne admits. Her fears are well-founded: There are cookbooks presenting vegan Mexican, Chinese, and Thai food out there written by white authors. Perhaps the most egregious example of appropriation is Thug Kitchen, the ultra-popular vegan cooking blog that eventually spun off multiple New York Times best-selling cookbooks that have sold millions of copies collectively. Thug Kitchen built a name for itself writing voicey, expletive-laced directions for its vegan recipes. The tongue-in-cheek style borrowed heavily from African-American culture (the name alone suggests as much), leading most people to believe that the anonymous author was someone like "a calorie-conscious, gangly young black man who’s particularly vehement about clean eating," as writer Akeya Dickson described in The Root. Instead, it came out that the blog was actually run by a white man and white woman, both in their late 20s. "It’s deceptive and feels a lot like the latest iteration of nouveau blackface," Dickson continued in the same post. Claiborne, Ornelas, and Badillo all shared the same negative, indignant reaction to the question of Thug Kitchen. "That’s not the kind of veganism I choose to follow," says Ornelas. Like most things, the divide in the vegan world boils down to money. 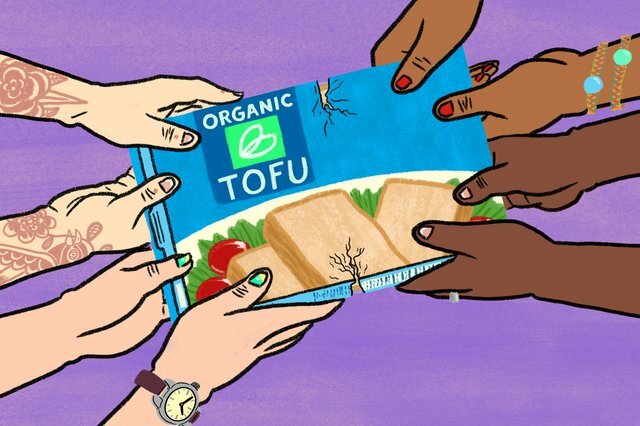 Brands are failing to capitalize on the buying power of vegans of color, often advertising for their snacks and beauty products with a noticeable drought of non-white faces. "I see this all the time, that these big vegan brands, they seem to be marketing only to white people," says Claiborne. The Instagram accounts of brands like Ripple, a popular plant-based milk alternative, and Sweet Earth Foods, which makes frozen vegan meals, are streams of naturally lit photos with few brown hands or faces. Claiborne finds it extremely frustrating when these brands sell in major stores like Whole Foods and Sprouts and fail to acknowledge that vegans of color shop there, too. "I don't know the numbers, but I'm sure a big chunk of their consumers, people spending money, are not white people," she says. It’s an issue that arises in funding organizations created for vegans of color. Ornelas faces this issue constantly with her work with the Food Empowerment Project, which she describes as a vegan food justice group. She and her team focus on promoting ethical veganism, but they also work to support farm workers and correct food access and inequality in communities of color and low-income communities (though these frequently overlap). "We are entering our 11th year, but we still don’t get the big bucks," explains Ornelas. While major vegan donors are willing to pony up plenty of cash to put towards their cause, Ornelas explains that they don’t see the Food Empowerment Project as a vegan organization. "They look at our work and they say this isn't really just focused on veganism," she says, so they don’t donate. It's a tough reality to swallow when there is a strong stream of cash being put towards vegan causes: PETA, by and large a mainstream organization (albeit a controversial one), received over $65 million in contributions in 2016 alone. Ornelas believes that prevailing veganism doesn’t always recognize that helping people to get access to more fruits and vegetables "is a form of working on veganism." It’s just one that doesn’t look like the veganism that most of them are used to seeing, she says, adding that "there are issues that interconnect, and that is not a distraction." Ornelas offers up a historical example of two interconnected issues: When Frederick Douglass was talking about abolitionism, he would also talk about women’s right to vote. "They were seen as linked, not as distractions from one another." This is where vegans of color feel the largest rift: that veganism is not a single-issue cause, but an intersectional one. Which is not to say that all mainstream vegans do not believe that veganism is a complex, multifaceted issue. (Thrillist reached out to several mainstream vegan voices for a comment and didn't hear back.) But the prevailing focus on the suffering of animals only, doesn't leave much room to focus on the human elements core to the vegan mission, either. "Veganism is not just about animals," states Claiborne. "It’s not only for one group, either. If you care about animals -- and humans are animals -- then it should be inclusive. All factions of veganism, in my opinion, should be about empathy towards every person." Ornelas puts it plainly: "You can be vegan and not cruelty-free." To Ornelas, solving food inequality in communities of color is a crucial step towards spreading holistic veganism. "People should be able to eat according to their ethics," she says. "They should be able to eat healthy and have access to fruits and vegetables, and options. A grave injustice is taking place that communities that do not have the same access to healthy foods that everybody else does." Many people of color are also now heavily dependent upon the sources of food that are available to them -- cheap cuts of meat and dairy products. These products were frequently introduced to these communities through European colonialism, even though many, especially people of color, are lactose intolerant. "Colonization is what brought these animals to our lands," says Ornelas. "We can't digest their milk. So we like to call it 'lactose normal' instead of 'lactose intolerant,' because intolerance makes it sound like there's something wrong with us when there's not." "So many people, including a number who are Mexican, don’t recognize how much of our food wasn’t really dependent upon cheese and animal products," says Ornelas. While "Mexican food" may conjure images of porky tacos and cheese-slathered enchiladas, it’s a far cry from indigenous Mexican cooking, in which meat was used sparingly, dairy was non-existent, and meals were constructed mainly from beans, wild greens, seeds, and squash. This inspired her to start the site VeganMexicanFood.com as a way to prove how vegan-friendly Mexican cuisine really is. It is a way to course-correct, to decolonize Mexican food and reclaim the heritage, centuries after Spanish colonists settled in Mexico in the 1500s who introduced meat and dairy products, changing the cuisine forever. This is true for the African-American community as well, says Claiborne. Before being brought over to the United States, the foodways of slaves were not heavily dependent upon animal products. Neither was the food they ate in the American South -- which was mostly plant-based. But during the Great Migration, when many blacks moved from the South to the North and West, they moved off of family farms where they were growing their own food, explains Claiborne. "They moved to these big cities with no outdoor space, so that took a lot of that plant-based culture. It was too expensive to buy vegetables all of a sudden, because they couldn't grow them themselves," she adds. In many ways, poverty forced them to find different food sources. These black communities soon became heavily reliant upon highly processed foods from fast food chains and convenience stores as their access to fresh fruits and vegetables became deeply limited. For vegans of color, the movement is also about health -- not just personal health, but that of their communities, while changing stereotypes in the process. "Communities of color can especially benefit from ditching animal parts," says Toliver. "Black Americans, we are disproportionately affected by obesity, more likely to have diabetes than white people. We're nearly twice as likely as whites to die from heart disease or stroke," he adds. Though the battle against institutionalized problems within our food system is an uphill one, Clairborne is hopeful that one day there won't be a divide between mainstream veganism and vegans of color. "I see organizations trying to expand to not include just the same old healthy American white people stuff," she says. Until then, vegans of color refuse to sit around waiting for mainstream veganism to become more inclusive. 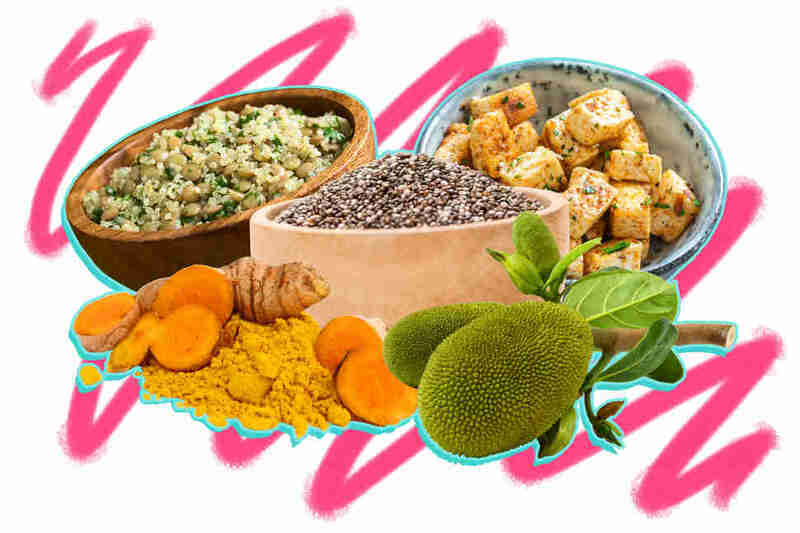 As their identities and communities are threatened across other facets of society, diet choice has become an important avenue for vegans of color to express, reclaim, and protect their identities. "I've heard other black vegans talk about living this way as a revolutionary act, and I totally agree," says Toliver. "It takes courage to unlearn these destructive habits that have been taught by both our families and centuries of oppression. There's something powerful about taking back one's health and consciousness." Khushbu Shah is a senior food features editor. Find her on Twitter @khushandoj.